Although the version number is not increased so much, this version is really a major milestone. From this version, a brand new “Container” concept is introduced into ForeUI, that means we can embed element into another one. Table Element becomes container now, you can press right key to drag another element into the table cell. The embedded elements are still selectable, so you can still tweak the elements even if they are embedded into the table cell. You can also extract the embedded element from the container by clicking the button in the floating tool pane. This version also bring us a brand new table editor, which allows you to specify the table row height and column width. You can drag the header to resize the column or row, you can also double click the header to toggle the sizing policy. The default sizing policy of column width is “auto”, which means allocate the size according to the content. The default sizing policy of row height is “fixed”, which will use the default table row height. In the editor you can also add/remove any row or column. You can hold the Ctrl key to select multiple cells and manipulate them. What’s more, you can also specify the cell alignment respectively. If no cell alignment is specified here, the default table alignment will be used. 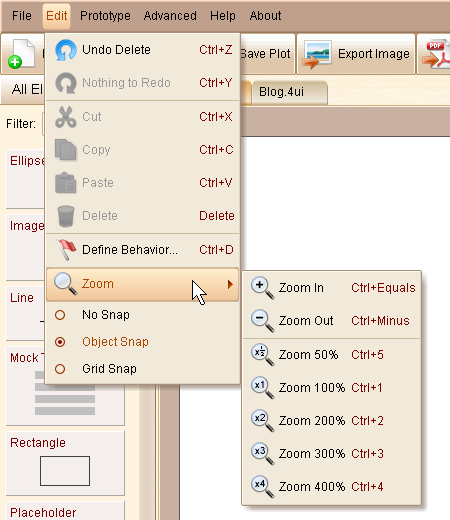 Hi everybody, it is Monday again This time we bring you the zoom in/out feature, which will help you a lot when you want to tweak the details of the wireframe or preview the whole design. The V2.20 also contains some enhancements and bug fixings (see below). This is quite useful enhancement. When you duplicate an element with some custom event handlers defined, if the custom event name contains the id of the element, the id part will be replaced with new id automatically. This is quite useful if you need an element has its exclusive custom event: just use the element id as prefix of the custom event name. You can pack such an element into custom element, thus it can always handle its own event, no matter how many instances are created. Here is an example. It is an interactive slider element (you can download it from the community). It has its exclusive custom event “TextBox_Slider_AdjustPos”, which starts with the element id “TextBox_Slider”. So you can create as many instances of it as you want and they will not interfere each other. Ajust the text positioning for all text elements. Bug_0182: TextBox with initial invisible state can not really become visible via “Change Visibility” action.